This lesson will help you develop a first draft of your recreational plan after first doing a woodlot inventory, assessing community recreation opportunities and goals, and looking at personal versus public use. The first step in deciding what outdoor activities you want to manage for is to do an inventory of your property. This means making a list of all the relevant features and current activities. 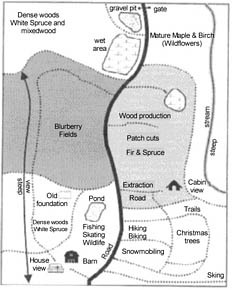 This information should then be put on a map of your woodlot. Knowing what you are starting with will help in determining which activities are possible. Referring to your management plan should be useful if you have one. As well, topographic maps and aerial photographs scaled to 1: 10, 000 may help you with your woodlot features. These are available from the Land Information Centre, 1660 Hollis Street, Suite 600, Halifax, N.S. B3J I V7 and four regional offices, phone 1-800-798-0706. Digital maps of some counties are available from Forest Inventory, Department of Natural Resources, Box 68, Truro, N. S. B2N 5B8, phone 893-5650. Some relevant features are listed below. Check the ones that are present on your land. The following sample map shows how some of these features could be represented. The next step is to draw an outline of your property. If you have a management plan, you can trace the map that comes with it. It will already show some of the features listed above. Include these on your map along with any additional features from the list. After drawing all your woodlot features on your map, make a few photocopies so you have extras if needed. In Lesson Six, you will be adding your final recreational goals to this map. Before you put time, effort and money into improving or creating a recreational opportunity on your land, it is wise to first find out what opportunities already exist in the community. This includes checking out the area around your community and talking with your immediate neighbors. What you discover may change your plans or help resolve a problem. For example, you may enjoy snow- mobiling and would like to have more trails on your land. But your woodlot is small and you do not have time to create a new trail. You contact the Snowmobile Association of Nova Scotia (SANS) and discover that they have trails close to your woodlot. You decide that for now you will use their trails and get to know the area. It is also important to ask about the future recreation goals of the community. What are the long range recreation plans? For instance, are there plans to develop ski trails or bridle paths? Cooperation can benefit the woodlot owner and local recreational groups. You will need to ask yourself if you want or need to duplicate existing or planned opportunities. You may have reasons for developing a similar activity on your own property (option one). Or you may decide to support the community effort in some way (option two). A third option is to partner with the community. Going back to the snowmobile example, it may be a future goal of SANS to increase the number of trails in your area. After discussion with the local club, you agree to cut a connecting trail through your property with their help. This gives you ready access to their network and gives snowmobilers a new trail. Partnering with your neighbors is another option that can benefit everyone (option four). Perhaps your neighbors enjoy the same recreational activity as you and that activity would be enhanced by managing adjacent properties for a common purpose. For instance, you enjoy hiking along the river to your property line where the trail ends. You would like to continue the trail up the river and loop back to your property. After some discussion with your neighbors who also like to hike, you agree to work together to extend this trail and create a loop you can both use. Looking beyond your own boundaries to management of a larger area is known as landscape design. It makes sense because opportunities and requirements usually extend beyond our property lines to natural boundaries such as watersheds or forest stands. It can be enlightening in terms of silviculture, wildlife, recreation and other values if we look at the bigger picture around us. Putting this into practice is not easy in a province where 47 per cent of the forested land is in small woodlots. For recreation on a landscape basis, you will need to consider the properties around you, what your neighbors preferences are and what you could do together. You may want to have a written agreement. If you don't know who owns an adjacent woodlot, the local Natural Resources office may be a useful starting point. An important question to answer in determining your recreational goals is whether to plan for personal or public use. Some people want to keep woodlot use as private as possible, especially if they value solitude. For others, companionship is an essential aspect of outdoor recreation whether the companions are personal friends, family or community members. Certain individuals have a strong community spirit and provide recreational opportunities on their land for public use such as swimming holes or educational trails. Maintaining a swimming hole for public use. Only you can decide whether recreational opportunities on your woodlot will be for personal or public use. However, there are a few factors to keep in mind. First, more people are using Nova Scotia's private woodlands for recreation. This is due to better roads and access, more leisure time, and a growing appreciation of nature among other reasons. Second, there is increased use of remaining natural areas. You may have noticed this on your own woodlot. More land is being used for intensive silviculture. While intensively managed land can be used for recreational activities and new logging roads have improved access, people generally prefer more natural settings for outdoor leisure activities. Third, it can be difficult to keep people off your land. As a landowner, you may have to go to civil court to press charges for trespassing in a non-commercial area. More information on legal issues is provided in Lesson Five. Placing the trail head close to your house may allow more control of access. You may want to read this lesson before deciding to promote public or personal use. Finally, as mentioned before, about half of the province's forested land belongs to small woodlot owners. Small woodlots are defined as having less than 400 hectares (about 1,000 acres). All these factors mean the small woodlot owner is an indispensable and inevitable provider of outdoor recreation. Once recreational use of a site has become established, it can be hard to stop. It may be fine with you if the public uses your land but you would like some degree of control. Some of your concerns may be keeping people out of managed areas, away from safety hazards or from damaging or littering your property. This can be handled to some extent through the use of gates, bridges, signs, litter cans and strategic placement of roads and trails where you can see who is entering or leaving your property. Some of these are discussed in Lesson Four. What outdoor recreational opportunities already exist in the community? What are the future goals of the community in this respect? Do I need to duplicate these activities? Do I want to partner with my neighbors? Do I want to develop my property for personal or public use? Answering the above questions may take some effort but it will be time well spent. The answers will put you in a better position to determine your recreational goals and objectives. A goal is your final purpose and an objective is the means to reaching that goal. For example, a goal may be to improve skiing on your woodlot and your objective is to upgrade a particular trail. Your intention may be to maintain or protect an opportunity. It may also be to improve existing opportunities or create new ones. Prepare a list of your outdoor recreation goals and objectives to create a recreational plan for your woodlot. It may help to refer to your list of recreational activities, benefits and values from Lesson One. You may also want to refer to your woodlot map for some idea of existing limitations and opportunities. You will be reassessing this list after studying the information provided in later lessons. Your goals should become more realistic and your objectives more specific as you complete the course and gain more knowledge.